I have been meaning to comment on the new church website on the Savior. In a word, I am impressed. No, that word seems too common and almost worldly. From a web design point of view, I am impressed by the style, the content, the layout, the colors and the functionality. They are first class. But for me, the right word to describe the overall web site, including it's purpose, is powerful. The website makes a bold statement to the world. The church and the web design team have not been hesitant over the years in proclaiming the message of the restoration. The church website on Joseph Smith has long been a great wealth of information about the prophet who ushered in this dispensation. Recently, the web team added great websites on President Hinckley and President Monson that are virtual testaments to these great men. This website on the Savior stands out to me in a class by itself. It is obvious that the designers worked long and hard to make the site simple yet powerful. It is not overwhelming on the surface and yet it is deep. The doctrines taught and the testimonies shared all serve to emphasize one purpose to the world: Mormons are Christians in every sense of the word. We talk of Christ, we rejoice in Christ, we preach of Christ, we prophesy of Christ (2 Ne 25:26). One of the greatest things about it is the accompanying tie-in to the special March 2008 issue of the Ensign, which is also all about the Savior. You will find some of the same articles both on the website and in the Ensign. I loved reading President Hinckley's testimony of the Savior. I know I have heard and read it before, but in this format, it will always to be his last testimony to me. With the Ensign was delivered a special memorial supplement on President Hinckley. Update: A video overview of this special issue of the Ensign has now been placed online. President Eyring's article is a wonderful invitation to come unto Christ. Elder Nelson's article focuses on faith in the Savior while teaching of our divine natures. President Packer's article is chalk full of doctrine and teaches clearly just who the Savior really is. Elder Holland's article focuses on the atonement and includes one of my favorite stories - Elder Orson F. Whitney's dream of the Savior in the Garden of Gethsemane. Each article is a witness of Jesus Christ. Taking advantage of multimedia and explaining why the church created this new website, you can even watch a video of Elder Nelson that proves that the church focus on using the Internet to share the gospel is intentional, determined, will continue and probably intensify. If you have not been to lds.org lately, I highly recommend you make a visit. There are links to other online videos with more apostolic testimonies, and the always great video, Finding Faith in Christ. How can the world not get the message? Mormons are Christians! Make no mistake about it. Those who disagree have either not seriously investigated the claims for themselves or are intentionally denying facts just to argue against us. Well, we know that there must needs be opposition in all things. There are way too many anti-Mormon websites out there. I, for one, want my blog to clearly show that I am a Mormon who believes in and testifies of Jesus Christ. 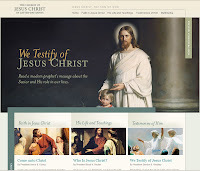 What did you think of the new church website on Jesus Christ? Have you visited it? I wish I read more often in the new Christ web site and the new Christ-centered Ensign issue the unequivocal statement: "We worship Christ." If one does a search at LDS.ORG one can find that quote, but I wonder if we say it enough. We often talk about faith in Christ, the atonement of Christ, etc. etc., but I wonder if there are gaps in our language that leave others wondering who and what our religion is about. Just a thought. To quote: "We do not worship the Son, and we do not worship the Holy Ghost. I know perfectly well what the scriptures say about worshipping Christ and Jehovah, but they are speaking in an entirely different sense--the sense of standing in awe and being reverentially grateful to him who has redeemed us. Worship in the true and saving sense is reserved for God the first, the Creator." So there you go. I guess it all depends on how much you accept the interpretations of Bruce R. McConkie. I have always felt that true worship is reserved for the Father yet I reverence the Savior for what he did for me. In this sense we may differ from many of our Christian friends. Now I am satisfied. The quotes are good enough for me. Why am I always looking for trouble when there is none?